Ok, another collection from the hellish fans Sondra Marshak and Myrna Culbreath. Taking in fact that they have been accused of hogging the initial fan-fiction publications for only them and their top vip convention friends, it’s clearer why this low-quality stories ever got published. There was an initial response to the unheard-of fanatical conventions, so getting ANY fiction at all published was a high priority. This book is interesting because of the prologue, which documents the convention feeling of that time, and also because one story is preceded by a writing of a cast member. Nichelle Nichols writes a preface on the awful “Suprise Story”, where they prepare a suprise birthday party to the captain. A typical fan-fiction piece, where they almost imagine themselves there in a silly situation. I absolutely hated it, especially the “getting out of the shower” bit. Then there’s “Snake Pit”, an awful story, but this time where women are protagonist. I don’t mind women in the center stage, but not when that’s the only purpose of the whole piece. As fan-fiction can be written in any way, the author of “The Patient Parasites” takes the liberty in writing it as a play. The story is a bit more typical “Star Trek”, but it’s very tedious even though the story is border-line interesting. One of the good ones of the bunch, but the play format does not help. “In the Maze”, by another women author. Absolute tripe and boring. And to keep it varied, they inserted a POEM, and written from Spock’s perspective. Also by a woman author. I’m not a poet expert, but I find it pointless, unless you adore and fantasize with Spock. Then, ANOTHER story by Connie Faddis: “Marginal Existence”, a semi-interesting short story full with robots and computers… and of course natives. Very similar to some original episodes, from where the author did not diverge much. “The Procrustean Petard”: Another fan-fiction fantasy: What if Kirk changed gender? Gruesome, and let’s leave it at that. And “The Sleeping God”, by a NASA scientist. 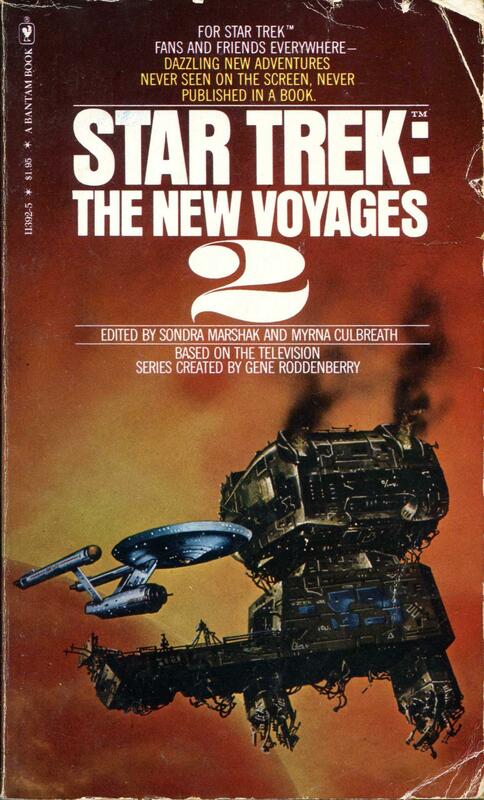 Not a bad piece, of novelette length, it were not another derivative of a common Star Trek theme: Fight against a sentient computer. Taking in accounts that these WERE early stories, taken directly from fan-fiction scenes and barely cleaned up for publication, it’s a wonder that some are not at all that bad. Even so, the amateurish of the works pass through, and will dominate the Novels for quite some time.